This side dish was amazingly flavorful and yummy, although not very beautiful. It’s healthy, vegetarian, and would also make a great filling for a vegetarian burrito. Zak and I both enjoyed it a lot and I know I’m going to be making it as a side again in the near future. It was quick, easy, and filling. 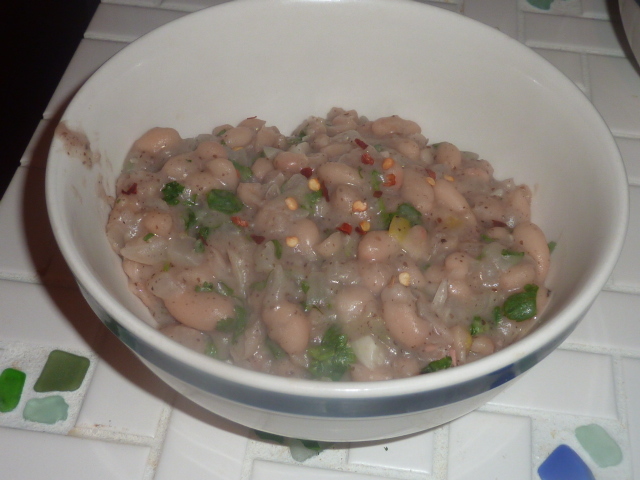 The cilantro and lemon lent a touch of brightness to the earthy, creamy flavors of the beans. Heat Brummel & Brown over medium heat in a small stock pot until melted. Add onion and sauté until translucent, 6-8 minutes. Add garlic and sauté until fragrant, 1-2 minutes. Add beans, sumac, lemon juice, kosher salt, and freshly cracked black pepper and stir to combine. Simmer 10-15 minutes until most of liquid is absorbed, smashing with flat of spatula to create a lumpy mash. Add cilantro and stir to combine. Garnish with some crushed red pepper flakes.